Another picture Enrico sent. The Nile in all its forms of 'giving': People taking a bath, washing clothes, picking up water, and in the background a barge taking people, cars, trucks and cattle across, a symbol of the Nile as a vein of the trade. Aaron published an amazing set of pictures with the sun setting over the Nile in South Sudan. Now we're on the subject of Aaron, have a look at his blog as a whole. Nice stories. 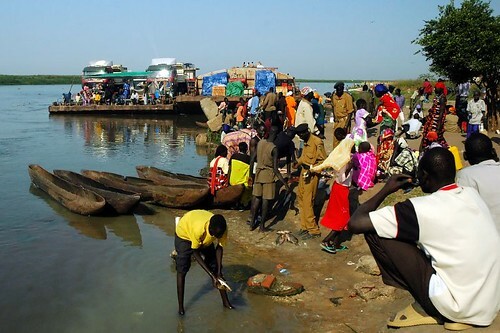 Wonderful pictures grasping the feel for Southern Sudan. Thanks for the reference! I hadn't seen the post way back when you did it. I've been back for awhile but hope to go back some day soon.